TolkienGuide.com - A decent price for a 1st ed SGGK? A decent price for a 1st ed SGGK? just wanted to ask out of curiosity whether this would be a decent price for a 1st ed SGGK but rebound? I bought a rebound copy of The Silmarillion from Peter Harrington a few years back; although it's half-leather not full-leather like this. It's a lovely, lovely copy; great feel to it. Anyway, just for context, he must have been able to get those rebound for under £100 judging by what I paid for my copy. Full-leather may be setting him back easy double that. Still, that's the binding price. So consider that too when looking at what you're buying. I'm not sure how much a first of SGGK goes for but this seems on the pricey side to me. Thanks for the feedback, it is much appreciated. And I felt it's a bit much, too, even though it looks gorgeous, I have to say. Looks like you can get a very nice copy in original dustjacket for less money (don't rebind these!) or a very reasonable copy at $700 and spend a few hundred on a very nice rebind. Given that these are sitting around on eBay, this would tell me that lower price copies will be available if you have patience, or one these sellers will be flexible if you make an offer. I have purchased numerous books from Peter Harrington, both bound and unbound, and you can be assured of the fact that when it comes to quality, Peter Harrington shines. 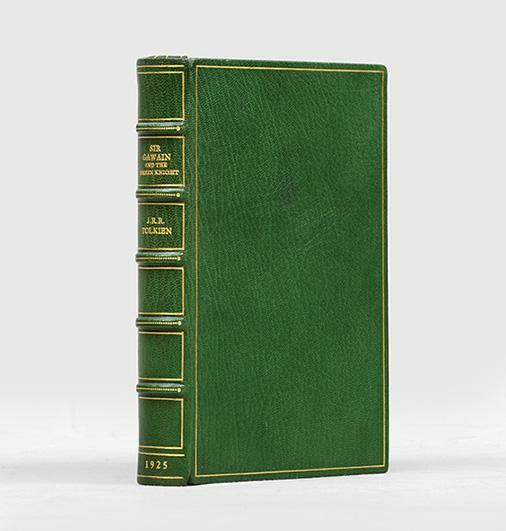 I have had 1st Edition Hobbits rebound by both Peter Harrington's Chelsea Bindery and the famous Bayntun Riviere and those two are definitely feast for my eyes. This is my personal suggestion, but if you are going to get a book reboud, get it full morocco leather. It's exquisite. Also, you could probably ask for certain discount, with a note that you will be frequenting more for more books in the future (and these third party sites charge fees which you could avoid if you contact directly with Peter Harrington).